I sometimes worry that things I heard when I was very young will be lost because at my age those things are now in such a distant past that few will remember or care. But as 100 years have passed since my father was in a trench in France when the Armistice was signed I thought I would write about Big 6. There is a town in Eastern Pennsylvania, Factoryville, which was the home of Christie Matheson. It is on Route 6 which was the main road East-West through Northern Pennsylvania at a time when oil was the king in the Keystone State. Now Big Six was the nickname for the great New York Giant pitcher Christy Matheson. Christopher Mathewson (August 12, 1880 – October 7, 1925), nicknamed “Big Six“, “The Christian Gentleman“, “Matty“, and “The Gentleman’s Hurler“, was a Major League Baseball (MLB) right-handed pitcher who played 17 seasons with the New York Giants. He stood 6 feet 1 inch (1.85 m) tall and weighed 195 pounds (88 kg). He was among the most dominant pitchers in baseball history, and ranks in the all-time top ten in several key pitching categories, including wins, shutouts, and ERA. In fact, he is the only professional pitcher in history to rank in the top ten both in career wins and in career ERA, if taking 19th century pitchers statistics into account. Otherwise, both Mathewson and Walter Johnson would hold that distinction. In 1936, Mathewson was elected into the Baseball Hall of Fame, as one of its first five members. 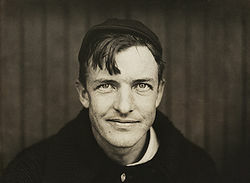 Mathewson grew up in Factoryville, Pennsylvania, and began playing semiprofessional baseball when he was 14 years old. He played in the minor leagues in 1899, recording a record of 21 wins and two losses. He pitched for the New York Giants the next season but was sent back to the minors. He would eventually return to the Giants and go on to win 373 games in his career, a National League record. He led the Giants to victory in the 1905 World Series by pitching three shutouts. Mathewson never pitched on Sundays, owing to his Christian beliefs. Mathewson served in the United States Army‘s Chemical Warfare Service in World War I, and was accidentally exposed to chemical weapons during training. His respiratory system was weakened from the exposure, causing him to contract tuberculosis, from which he died in Saranac Lake, New York in 1925. What isn’t mentioned in this bio was that his battery mate was Roger Bresnahan who was Irish and was known as the Rose of Tralee, a fact you can use as you wish. So if you want to pass this story on to some youngster who loves the game you may also tell him Jacques Barzun’s famous quote Whoever wants to know the heart and mind of America had better learn baseball, the rules and realities of the game — and do it by watching first some high school or small-town teams.